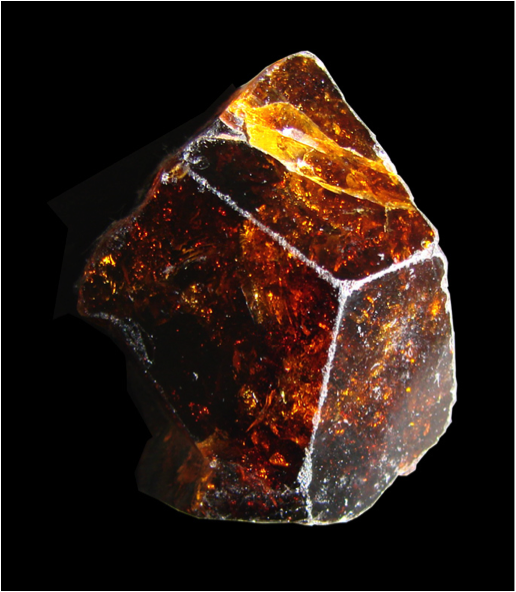 SANTITE is on Crystallography 365! It’s a little bit of a stretch, we know (go on, you go and look for more Christmas-inspired minerals!) but here is Santite! This mineral was first identified from synthetic means, it’s crystal structure found in 1937. Then in 1970 a group of Italian scientists identified this material in the hills of Tuscany (hard field work, eh?). They named it after a former director of the Museum of Natural History of Italy, George Santi. It’s a very rare borate mineral, where the boron hooks up to oxygen and (rather pleasingly) forms paper chain like features running thought the structure – interwoven with potassium ions. 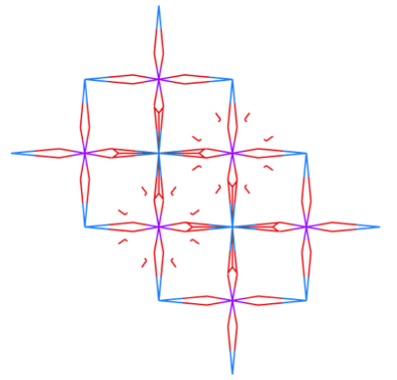 Santite, or its synthetic name potassium acid dihydronium pentaborate #9011411 in the Crystallographic Open Database, and was found by Zachariasen in 1937. Augite is a very dark green to black colourer mineral. It is made up of silicate chains with principally magnesium, iron, calcium and aluminium atoms sitting between them. There’s quite a variation in which of these elements are found in the structure, but the chains mark the structures as belonging to the pyroxene family of minerals – like Jadeite. One of the striking features of this mineral is its, ahem, cleavage. Many minerals will split open along particular directions, this is usually from a weakness in their crystal structures. Augite has two prominent cleavages, which meet at about 90 degrees. 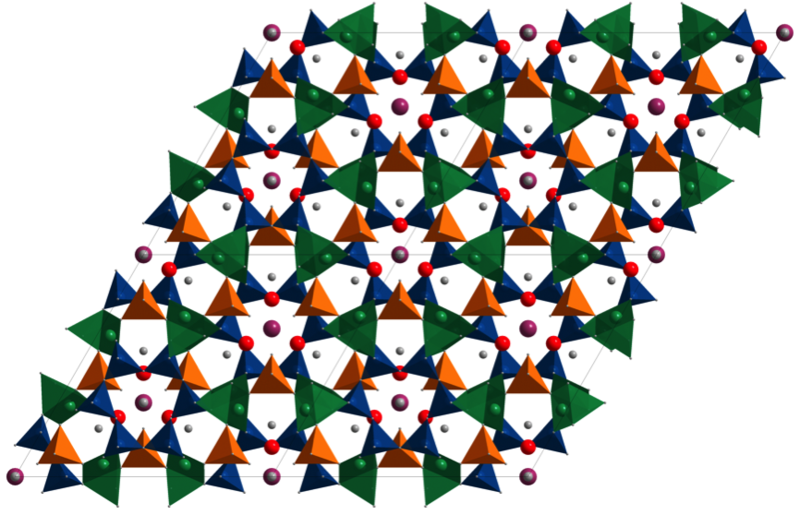 The crystal structure of wurtzite is #1200006 in the open crystallography database. While many of the other birthstones we have investigated this year have had a definite colour to them – sapphire rather than ruby for example, this month’s stone has something for everyone. Here is tourmaline. This picture was produced using the Diamond Crystal Structure Visualisation Package. Mg is red, Na is maroon, Al is green, Si is blue, O is grey and B orange. Tourmaline is a trigonal cyclo-silicate which typically forms large prismatic crystals. It has the formula (Ca,K,Na,)(Al,Fe,Li,Mg,Mn)3(Al,Cr,Fe,V)6(BO3)3(Si,Al,B)6O18(OH,F)4, which is a right mouthful! The structure has 6-membered rings of corner sharing Si and Al tetrahedra as well as BO3 tetrahedra. In the gaps between these large cations of Ca, K or Na can be found. The brackets around some of the elements in the formula tell us that these elements are interchangeable on those sites. So clearly, there is a lot of scope for different compositions in tourmalines. This variation is what leads to the large variety of colours that tourmalines can come in. Tourmalines are some of the most chemically diverse minerals in the world. Tourmalines are usually found in a range of igneous and metamorphic rocks, most commonly in granites and granite pegmatites, (just like last month’s birthstone). Mg –rich tourmalines tend to be restricted to schists and marbles. Schorl is the most common type of tourmaline. They were named for the town in Germany where they were first found in large quantities. They are typically black to dark blue to brown in colour. 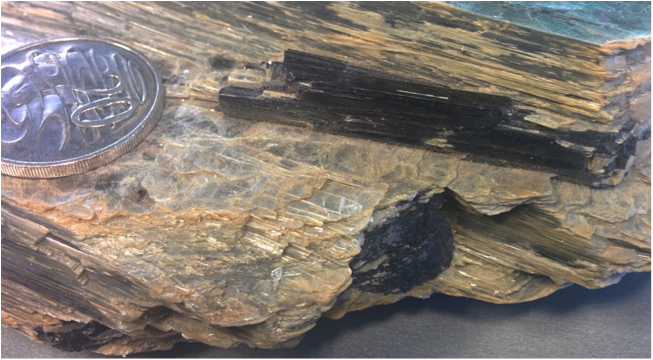 Figure 2 shows a couple of schorl tourmalines in a large book of mica. Schorls are sodium – iron tourmalines. Figure 2. Black Schorl tourmaline crystal. 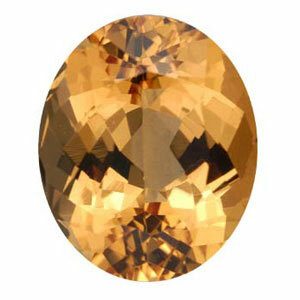 Dravites are brown tourmalines. They are magnesium and sodium rich and typically vary from dark yellow – blue in colour but can also form deep green chromium and vanadium tourmaline varieties. Elbaites are lithium containing and show the most variation in colour. Elbaite was one of the minerals from which lithium was first discovered. They are named for the Italian island, Elba, where they abound. The most common forms are: Red – Rubellite, Light blue – green – Indiocolite, Green – Verdelite and colourless – Achroite. It is common to find variations in composition in zones within individual crystals. 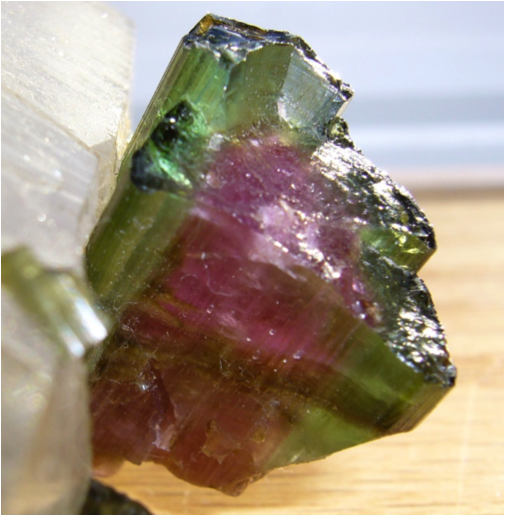 This leads to one of the most well-known tourmaline phenomena – watermelon tourmalines – see figure 4. With so much variation in colour, there really is something for everyone if you are born in December! Hamburger G E and Buerger M J (1948) The structure of tourmaline. American Mineralogist 33 532-540. It is available on the American Mineralogist Crystal Structure Database. 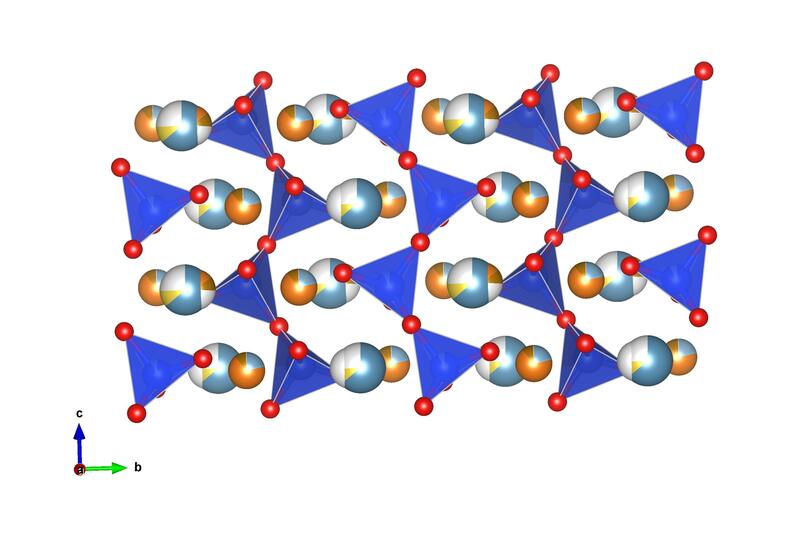 Two views of the Spherocobaltite structure, blue atoms are cobalt, red oxygen and brown are carbon. When you think of the word ‘mineral’ and then imagine the types of colours that associate with that – you’ve probably got ‘grey’ or ‘rock-coloured’ in your head first? I hope that on this blog so far we’ve managed to show that minerals can really come in all colours – through the ‘magic’ of chemistry. “Spherocobaltite-260478” by Rob Lavinsky / iRocks.com – http://www.mindat.org/photo-260478.html. Licensed under CC BY-SA 3.0 via Wikimedia Commons. Today’s is pink! 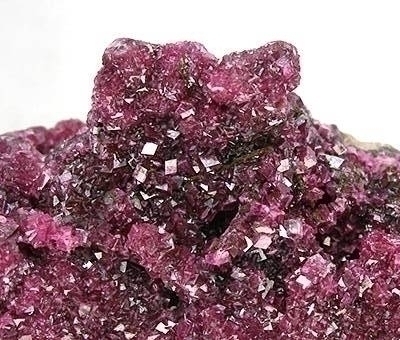 Spherocobaltite, is colbate carbonate (or CoCO3), and it’s the cobalt that gives this mineral it’s lovely pink hue. It’s a hydrothermal mineral, forming originally from a hot soup of elements. It’s usually found in veins, where the hot fluid has flowed through crack in the rock. It you think you seen this all before, then you’ve obviously been pretty keen on our blog! 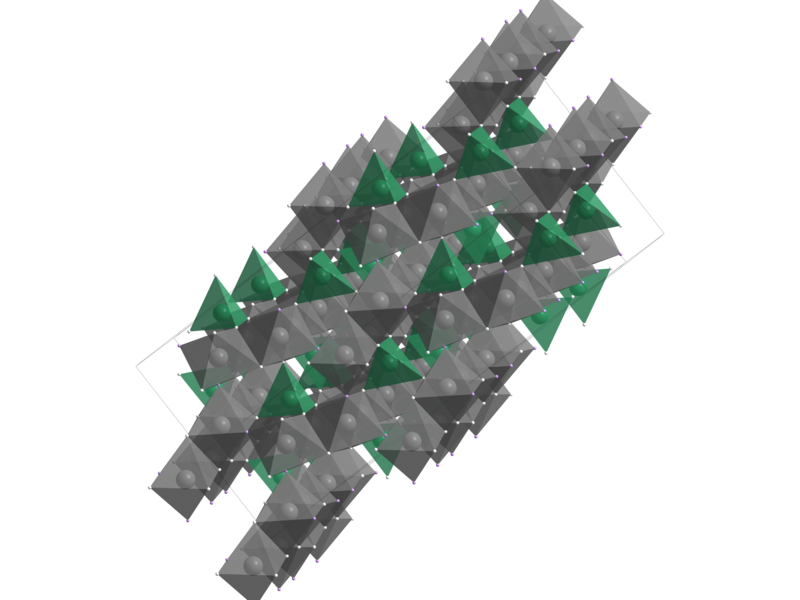 The structure of spherocobaltite is the same as calcite (CaCO3), only with cobalt atoms instead of calcium ones. The structure of Spherocobaltite that we’ve featured was determined by Graf in 1961 and was published in the journal American Mineralogist. It’s #9000101 in the Crystallography Open Database. Jadeite is from a family of silicate minerals, called pyroxenes, which are distinctive for their single chains of silicate tetrahedra (the blue shapes with red oxygens in the corners). 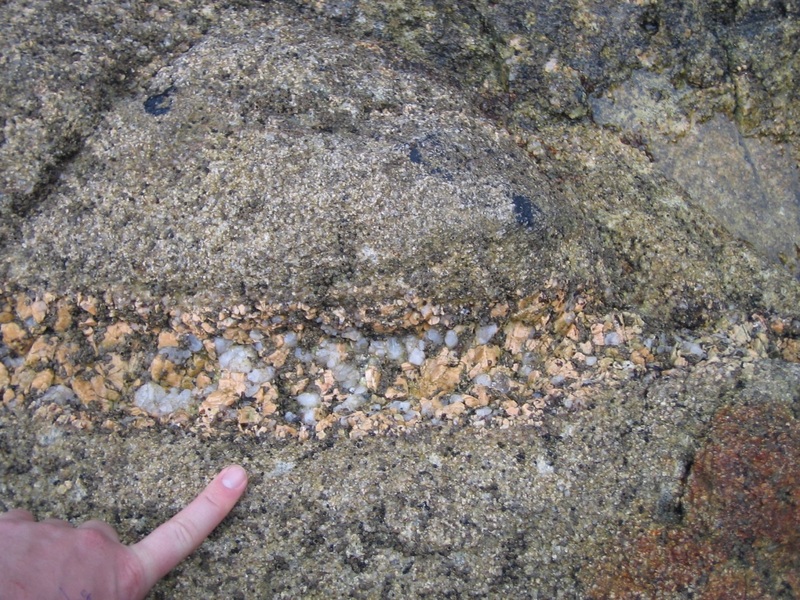 This particular mineral has sodium (gold) and aluminium atoms (light blue) between the layers. Pyroxene minerals are an important part of the Earth’s crust and mantle, and are found in many igneous and metamorphic rocks. Gem quality jadeite is only one of the two materials that are known as Jade, the other being nephrite. 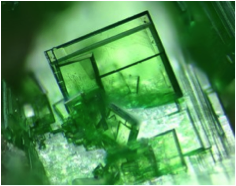 Jadeite is structure #9000143 in the open crystallography database.